Pilot tour for explorers – you can be a part of it. 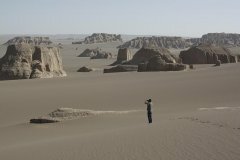 The big desert of Lut with the area of 5400 km2 is situated in the east and southeast of Iran .In a major part of this desert, there is no animal and vegetable life of any kind.The very beautiful and typical phenomena abound in this desert. This desert has a few universally unique specifications. Lut desert due to the rough environmental conditions and the limited facilities of life is almost deserted. Also, because of limited number of roads passing through, the problems and difficulties of urban development resulting from civil industrial activities do not face it and it is perfectly intact and virgin. 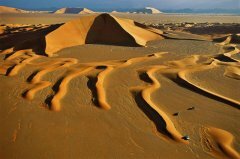 Its natural and various phenomena have remained intact since far years and it is the only natural changes which lives their usual effect on this desert. Iran's geography consists of a plateau surrounded by mountains and divided into drainage basins. Dasht-e Lut is one of the largest of these desert basins, 480 kilometers (300 mi) long and 320 kilometers wide, and is considered to be one of the virgin places on Earth. The eastern part of Dasht-e Lut is a low plateau covered with salt flats. In contrast, the center has been sculpted by the wind into a series of parallel ridges and furrows, extending over 150 km and reaching 75 metres in height. This area is also riddled with ravines and sinkholes. The southeast is a vast expanse of sand, like a Saharan erg, with dunes 300 metres high, among the tallest in the world. 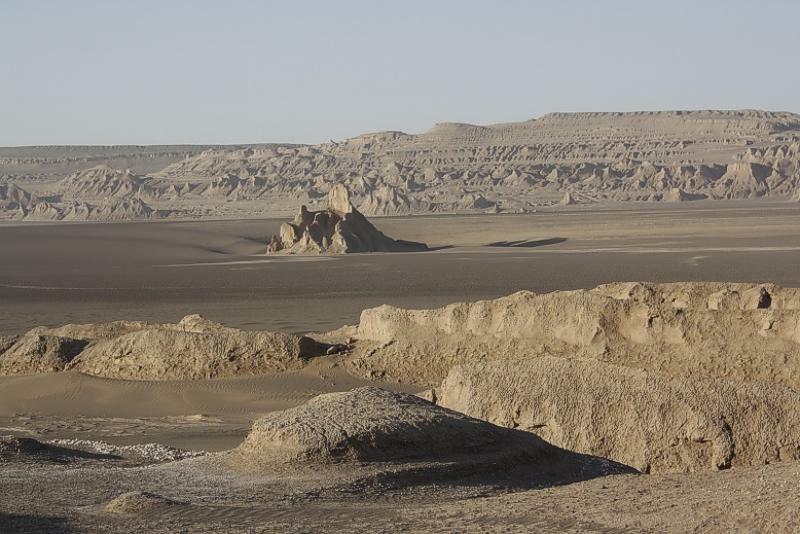 Measurements of MODIS (Moderate-Resolution Imaging Spectroradiometer) installed on NASA's satellite "Aqua" from 2003 to 2005 testify that the hottest land surface on Earth is located in Dasht-e Lut and land surface temperatures reach here 70.7 °C , though the air temperature is cooler. 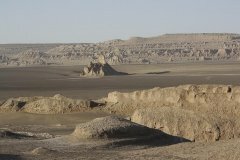 The hottest part of Dasht-e Lut is Gandom Beryan, a large plateau covered in dark lava, approximately 480 square kilometers in area. According to a local legend, the name (in translation from Persian — "Toasted wheat") originates from an accident where a load of wheat was left in the desert and was eventually scorched by the heat in a few days. The price for every individual client is 3500 €. 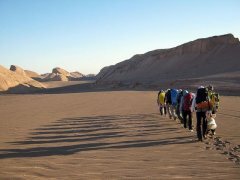 This itinerary is designed for a 10 day trip that 6 or 7 days are in the Lut desert. It’s possible for the guests to fly from Tehran to Kerman in the first day and back to Tehran in the 8th day. Maximum capacity for this trip is 10 guests. Number of the cars vary from 3 to 5 depended on the logistics. All the meals and hotels at the first and last night in Kerman are included. The possible time for this tour is at the early December to the end of March. Overnight in Kerman or Mahan, meet the expedition Team and briefing for the upcoming tour. 2nd day: leaving Mahan/ Kerman heading to Shahdad and Nehbandan at 9.00 am. Leaving the main road and entering the dirt road and continuing for 10 km in the dirt road. During this time from Mahan to this point( 10km in the dirt road), no pit stop is allowed. Serving lunch in the desert, visiting the Zabane Mar canyon and camping in a safe and suitable area. 3rd day: waking up at 7.30 , serving breakfast and starting to hike for 2 hours heading the star shaped sand dunes. Safari rides on the star shaped sand dunes and having lunch by the dunes. Camping in a safe and nice place. 4th day: waking up at 8.00 and serving breakfast. Passing the Lut desert plain heading toward the Yalan sand dunes. Serving lunch on the dunes and setting up the base camp. Hiking and sand boarding in the dunes. 8th day: the 8th day of the trip is as a reserved day for any probable incidents that might happen. If not, its possible to stay in Shahdad desert camp or visiting the famous castles or caravansaries at this area. 10th day: driving toward Tehran. Overnight in a hotel in Tehran. We explicitly want to inform you that this trip is an expedition and the success depends on weather or political situations. We are working with permits from the Government and Municipality of Iran and the Province of Kerman and the tour is permitted. We are acting in a completely undeveloped environment and each participant’s health and body condition needs to be sufficient.